Cheap multi effects pedals are the only real option for those of us on a tight budget who want a wide choice of effects, from distortion to delay, and a variety of amp models for direct line out recording. The four units featured on this page, each offering a different configuration, will give you the quality, functionality and range of effects and tones you need for the studio and live stage. Defining Features Basic, with optimally pre-programmed presets for those who prefer to spend less time on deep editing/tweaking. Expression pedal, loads of user presets, looper, optional USB power. Ultra compact and mobile. Loads of artist created presets. USB connection for loading/editing presets. Loads of effects, looper, best output options such as USB recording and XLR. 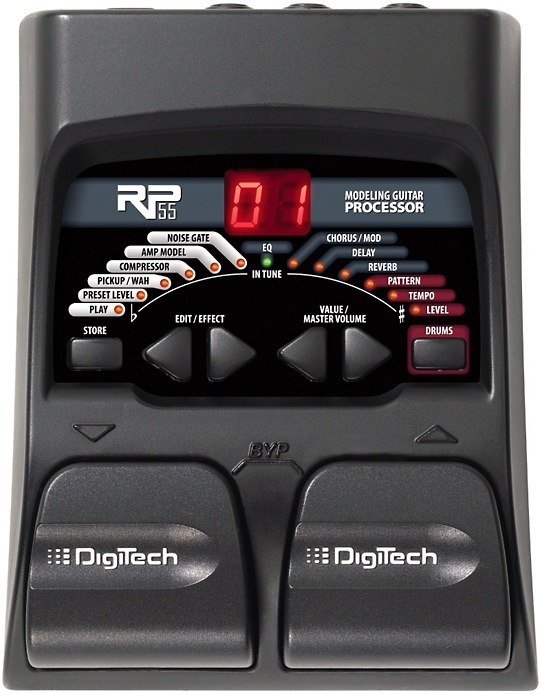 For anyone starting out with multi-effects, the Digitech RP55 gives you a good number of effects, amp models and distortions in a compact unit for $50. You'd expect to pay at least that for a decent single pedal, so it's by far the most generously spec'd multi-effects unit for the price. The RP55 is especially for those who don't want to spend much time dialling in and tweaking their tone, as the factory presets have pre-programmed parameters. So it's just a case of flicking through the presets and finding up to 8 effects/amps/distortions you want to use at any given time. Wham, bam, thank you mam, in other words. So there's less emphasis on creating unique parameters, and more on simply tapping in the effect(s) you want and playing. You can store up to 40 of your own combinations, accessible through the dual on board footswitches, so there's still plenty of customisation potential. There's a basic, 3-band EQ if you do want to tweak the presets. Amp/cab models include Blackface, Hot Rod, Clean/High Gain Tube, Stack, Tweed, Rectifier and Boutique, giving you a good range of starting points for your tone. Among the 20 effects you have all the standards (chorus, reverb, delay, flanger, phaser) with the addition of some more experimental effects such as "AutoYa", Pitch Shifter and Detune. Plus, you can connect an external expression pedal (not included) to control the volume, wah or whammy. 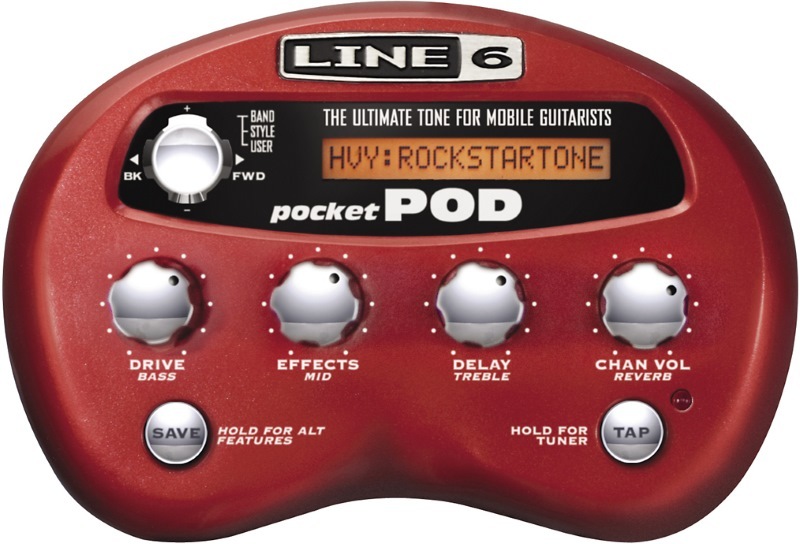 Even at a mere $50, there's nothing particularly missing from the RP55 in terms of effects, models, tuner, user patches and even the 30 sample drum machine. 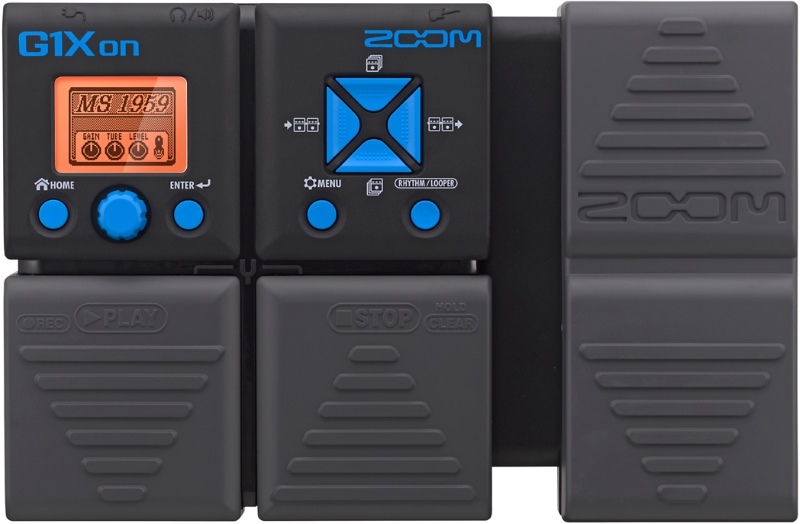 But deep control over your sound is limited in favour of "tap/stomp and play", which many actually prefer, and DigiTech clearly have the experience to program in presets that will satisfy most ears. It's rare to find a multi-effects unit with an expression pedal for less than $100. 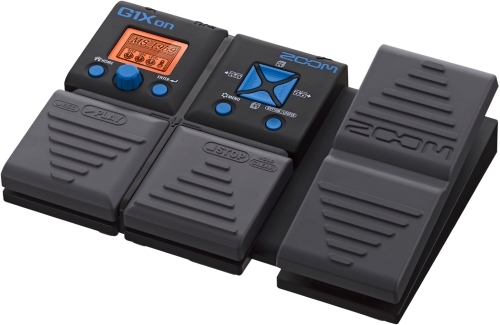 The Zoom G1Xon gives you just that, with overall more effects, models, stomp boxes and control than the slightly cheaper DigiTech. You also get the added bonus of a looper, 68 drum samples and the option of USB power (which can also be used to update the unit from your computer/device). With 22 amp/cab models, 12 separate overdrives/distortions and 41 effects, any 5 of which can be chained together in your chosen order, there are plenty of options for shaping your desired tone. There are no factory presets, but up to 100 user created patches can be saved and recalled - far more than what most guitarists would use. As well as manually saving your creations, there's a handy auto-save feature (optional), so any changes won't be accidentally lost. You can also name your patches with up to ten characters for easy identification as you're flipping through. If you want to scroll through your patches without immediately switching from the current sound, you can do this silently using the "pre-select" function and then engage the new patch when you get to it. This is useful if you're playing on stage and want a smooth, well timed transition between patches. The auxiliary input allows you to connect a number of devices, such as personal music players, so you can play along to your favourite tracks. The LCD display is more graphically detailed than the DigiTech and Pocket Pod. As expected, the expression pedal controls the volume, wah and other dynamics, but it can also be set to control gain, modulation speed and a whole host of other effect parameters. It can also be calibrated to your desired sensitivity level - great for the heavy or light footed among us. While you do get a lot more than the RP55 for the extra $20 or so, with more features comes more complexity. If you're easily overwhelmed with the technical aspects of tone shaping, then you might prefer the more minimalist DigiTech option. But for those who have less than $100 to spend yet still want features typically found on more expensive units, the G1Xon is the best compromise you'll find. Not strictly a pedal, but an ultra compact, mobile tone shaping machine with the largest number of factory presets (300) of the four picks. The presets themselves have been developed by respected artists, meaning you can instantly tap into studio quality sounds heard on many favourite albums. Further presets can be downloaded and custom patches created on your computer before sending them to the Pod via USB. This feature alone separates the Pod from the cheaper models above for those who like to keep their creative options truly open. As well as the presets, you have the choice between 16 effects, including combinations, which can be tweaked using the on board knobs. Very easy to use and visualise with the aid of a wide, bright LCD display. Amp models are the same as those found on the larger Pods, with 48 in total - the most generous out of the four units featured here. You can even match up different amps and microphones to get as close to an authentic simulation a digital processor can offer. With the Pocket Pod being so small, its designers have been forced to make each button and dial as multi-purpose as possible. So you'll find yourself holding buttons to change the function of the dials and to access the tuner. But it's intuitive enough and clearly labelled that you won't have much bedtime manual reading to do. Overall, the number and quality of effects and models that comes out of this tiny device is impressive. You'll just have to think about whether or not the absence of pedals is going to be a big deal. While there's no reason it can't be used on stage, the Pocket Pod is clearly more suited to studio and on-the-go recording and writing. The most expensive and, in some respects, feature rich of the four units. 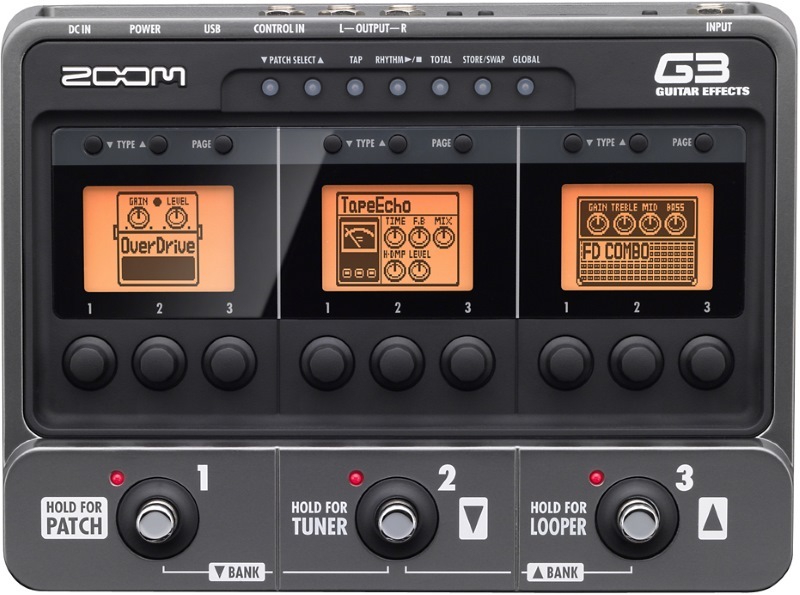 Building on the very capable Zoom G1, the G3 adds a further 38 effects (79 in total), 3 additional distortion stomp boxes (15 in total), but retains the 22 amp models and 100 user preset spaces. There's also an additional 3rd footswitch, giving you more hands-free control over your sounds, along with a 3rd LCD display to keep everything in co-ordination. While the G3 doesn't have an expression pedal, the G3X does, for an extra $50. Because the unit is larger, the controls are more sparsely positioned and independent. Instead of cycling through options on a single display, you can set your parameters more independently and efficiently. The tuner also offers a wider array of standard and drop tuning presets than other multis. To many, it's the additional inputs and outputs that will make the G3 more appealing than the G1. There's an XLR output, with the option of pre or post-EQ, passive or active input, output for left and right speakers (left for mono), and the big one for many - a USB output which allows you to record directly to your computer, and doubles up as a way to load and edit your patches. As an added bonus, you get the latest Cubase LE software shipped with the G3, giving you one of the best DAW's used by professionals around the world. In short, it's the G1 on steroids, for about $90 more (or $140 more if you want the expression pedal). Out of the four picks, the G3 gives you the most control, greatest combined number of effects and models and the most generous input/output panel for direct recording and connecting to amps and devices.